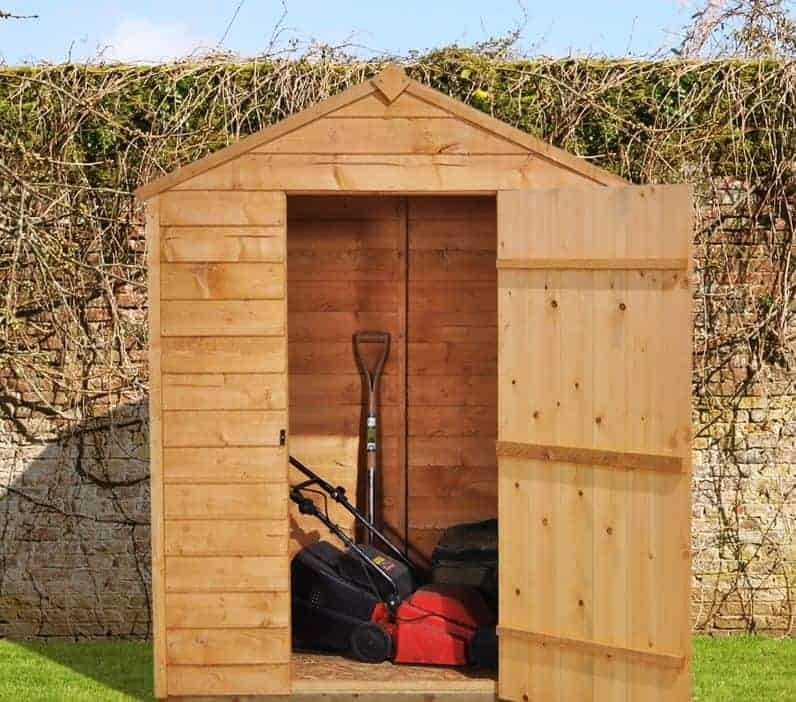 This 5 x 3 Shed-Plus starter shed is designed to be an entry level garden shed that nevertheless provides a more than adequate storage space for everyday gardening needs. The apex roof carries water efficiently away, and also increases the amount of space inside the shed. Although the door height itself is small, the headroom inside the shed makes it more comfortable to stand up in. There are no windows to this shed, which in itself is a bonus when it comes to shed security, always an important consideration. Combined with the button turn latch, it provides a real deterrent to opportune thieves, keeping your goods dry and safe. There is also the ability to add a padlock to the door, although you won’t find one included as standard, to give you extra peace of mind when you lock the door behind you. Shed-Plus have dip treated the walls of this shed, which is very important, especially in the early months of a shed’s life. This preservative treatment gives the manufacturer the confidence to provide a ten year guarantee against rot, making the shed even greater value for money. There is still an emphasis, however, on the shed owner re-treating the shed in subsequent years. 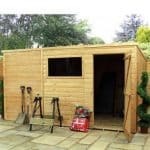 The Shed-Plus Starter Shed is a wooden, overlap security shed which is space saving and designed for the smaller garden. It has an apex roof which adds to the storage capacity without taking up more space in your garden. Covered by black sand felt the rood offers long lasting protection against rain and snow. One special feature about this shed is that it has no windows. This makes it an ideal location to store valuable items that could otherwise attract the prying eyes of passers by.The roof is 1.95m tall, with an eaves height of 1.57m tall. The width of the shed is 1.61m while the depth of the shed is 0.94m, both measurements including the overhang. The door has a generous width of 0.66m when compared to its height of 1.53m, so remember to duck your head when entering or exiting the shed. The overlap cladding of this shed is in line with many of today’s sheds. This allows the manufacturer to create a shed that is both durable and weather resistant, and yet still at a more than affordable price. The cladding used on this shed is 5mm thick, which is fine for everyday use but it will need to be treated at least every two years to give it extra toughness and durability. 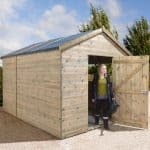 As with many other entry level starter sheds, this has a standard frame type that is designed to deliver both practicality and value for money. Made of European softwoods the overall effect is attractive, and it will complement the aesthetics of any garden. It is really important to treat overlap sheds as soon as they have been assembled. We recommend a spirit based treatment which not only provides the best protection, but it also doesn’t always need to be applied annually. You will need to check the manufacturer’s instructions to see exactly how frequently the treatment should be reapplied. Our weather patterns are becoming increasingly unpredictable, and so it’s essential that garden sheds are given the protection to endure rain and snow that could otherwise lead to rot. Shed-Plus have thought of this, and the walls of their starter shed have been dip treated. Dip treating allows the rot fighting preservative to penetrate deep into the substrate, giving it long lasting protection throughout the timber rather than simply being on the surface. 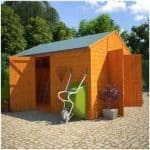 The manufacturer’s confidence in this shed is shown by the generous 10 year ant-rot warranty that they provide. It’s important to note, however, that they state that the shed will need to be re-treated at least every other year. As with all guarantees, it’s essential to follow the manufacturer’s guidelines to avoid invalidating the cover. As the name of the shed suggests, this is designed to give adequate storage space without extraneous features, and it certainly delivers on this. There is a single entrance, which although not tall is wide enough to allow easy access to the interior. Once inside, the shed is surprisingly spacious allowing plenty of storage space for garden equipment, lawn mowers, tools and anything else. It has no windows, so you’ll need to bring or install a light source to compensate for the lack of natural light, but this in itself is an additional security feature. We are a little disappointed with the security of the shed. While the windowless feature means you do benefit from excellent privacy, there isn’t much else included that will deter thieves. The turn button lock won’t keep out determined thieves so it is recommended that you invest in the 49mm weather-proof padlock. This actually comes with a hasp and staple which makes it good value for money. Security is becoming increasingly important for garden sheds, as the number of shed break ins continues to rise. Many of these burglaries are conducted by opportune thieves who have seen items that they can re-sell through the shed window. With a windowless shed such as this one, your belongings are safely stored out of sight, which can reduce the risk of an opportunistic break in occurring. The button turn latch on the door also adds to the overall security of this starter shed. Easy to operate, it provides a solid fastening which adds an extra deterrent to people who may attempt to gain entrance. 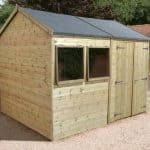 This starter shed is designed to be a low cost storage option, making it ideal for people who are new home owners, as well as those who are looking to enhance their garden while operating on a tight budget. For this reason, the shed does not come with many optional extras, but this in itself allows the owner to add their own personal touch to the shed. The shed as it comes has a rustic feel to it which is very much in keeping with current garden fashion. Although the wood is unpainted, the dipping process ensures that the timber has a slightly darkened, almost golden, appearance. The unpainted nature of the shed allows the owner to choose a colour of their own choice, allowing them to express their own personality through their garden shed. It’s worth remembering that the UV rays from the sun fade wood over time, and can lead it to take on a silver grey colour, so painting or staining the shed will help to prevent this fading and enable it to retain its vibrancy. One accessory that can be added to this shed is a padlock. The shed itself doesn’t come with one as standard, but the hasp and staple locking system can be further enhanced by the addition of a padlock to the handle itself. For such an affordable price tag, there is no drop in construction quality. 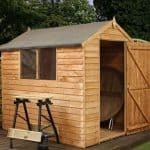 Shed-Plus have not cut any corners with the construction, and because it's made from European wood and manufactured in the United Kingdom it also scores well with its carbon footprint. The ten year anti-rot guarantee is testament to the efficacy of the dipping treatment, but this does have to be supplemented by further preservative use at least every two years. For added peace of mind, we would recommend an annual treatment. 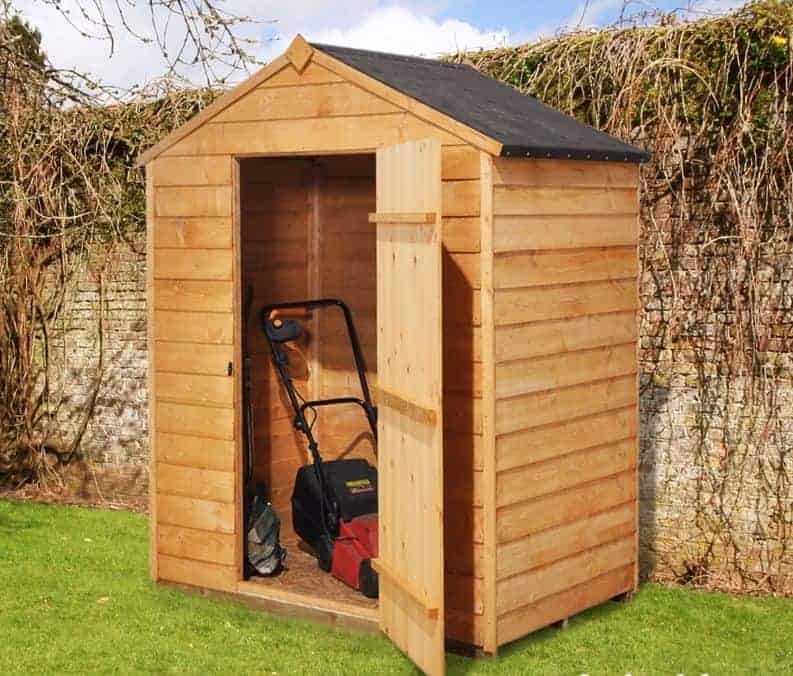 The 5 foot by 3 foot area is enough to store a lawn mower and a selection of garden tools, but these compact dimensions mean that you won't want to spend too much time in there yourself. Nevertheless, the height of the apex roof does add significantly to the space available, and makes it more comfortable to stand up in. One advantage of this shed's size is that it is quick and easy to assemble. The instructions are clear and simple to follow, and self assembly by two people is a less than strenuous process. 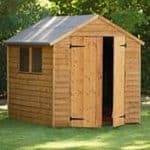 For a relatively low cost, garden owners can now have a shed that is excellently constructed, and that comes complete with a 10 year guarantee. Future preservative treatments and paint or stain will add to the initial cost, but it remains suitable for those on a budget. Final Thoughts: Shed-Plus have created an excellent beginner's shed for a price that makes it affordable to people who would otherwise have to forego the benefits of having a garden shed. It doesn't take up too much floor space, and yet the clever design means that its storage capacity is surprisingly good. The no-window design gives it extra security, although the lack of a painted finish means that a little extra work is required by the purchases. This in itself, however, allows them to select a colour scheme that will fit in perfectly with their own garden. 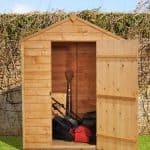 Overall, this is an excellent introduction to the world of garden sheds, and a low cost way to increase the amount of outdoor storage space.